Duplication of ureter is an uncommon anomaly with a reported incidence of 0.6%–1%. It can be either complete or a partial duplication. 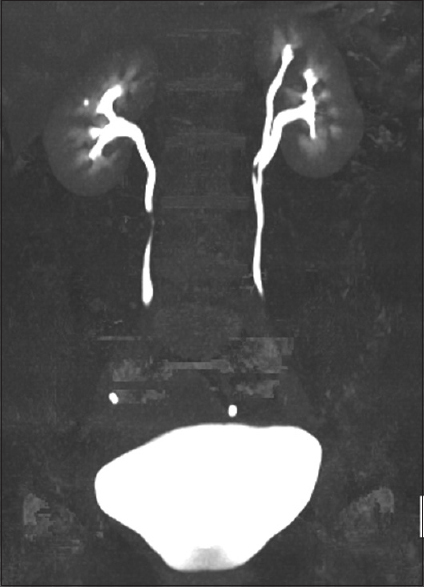 We present a case of live-related renal transplant in which complete duplication of ureter was found as a surprise during bench preparation of the donor kidney, which was reported as partial duplication on the pre-operative multidetector computed tomography. A common ostium was made from the two ureters and was anastomosed to the bladder. At 2-months follow–up, the patient has good graft function and no evidence of ureteric complications. Since double ureter does not seem to increase urological complications, such donors should not be rejected. Renal transplant is the best form of management in patients with end-stage renal disease. Due to paucity of cadaveric and live donors, donor selection criteria has been relaxed to include marginal donors to expand the donor pool. Renal vascular and ureteric anomalies are no longer considered a contraindication by most transplant surgeons. Duplication of ureter is an uncommon anomaly with a reported incidence of 0.6%–1% in cadaveric kidneys procured for transplantation. This can either be complete duplication or partial duplication and is usually diagnosed preoperatively with great accuracy by multidetector computed tomography (MDCT). We present a case of live-related renal transplant in which complete duplication of ureter was found as a surprise during bench preparation of the donor kidney, where as the pre-operative MDCT reported a partial duplication with fusion at mid-ureteric level. A 46-year-old hypertensive male with chronic kidney disease was planned for a live renal allograft transplantation. Donor was his 37-year-old wife. It was an ABO compatible transplant. Both the recipient and the donor underwent standard preoperative evaluation as per the institutional protocol. Multiphase computed tomography (renal donor protocol) of the donor revealed left single artery, single vein, and proximal ureteric duplication in the upper part with fusion at the level of L3 [Figure 1]. The donor underwent left open donor nephrectomy by a flank incision through the retroperitoneal approach. During perfusion on the bench, the two ureters were seen separately, running in close proximity in a common sheath [Figure 2]. As an intraoperative surprise, both ureters were completely separate till the lower end. In the recipient, the kidney was implanted in the right iliac fossa in the extraperitoneal space. The renal vein was anastomosed to the external iliac vein in an end-to-side fashion while the renal artery was anastomosed to the internal iliac artery in an end-to-end fashion. A longitudinal incision of 1 cm was made in the adjoining sides of the lower ends of both the ureters. The anterior walls of both the ureters were sutured together to form a common ostium. This common ostium was anastomosed to the bladder by the modified Lich-Gregoir technique. Double J (DJ) stents were placed in each ureter through the common opening. The patient was allowed orally on the first postoperative day (POD). Drain was removed on day 4. Tc99m-DTPA (diethylenetriaminepentacetate) performed on the 4th POD revealed normal functioning transplanted kidney with nonobstructive clearance, and the renal Doppler showed normal flow with no evidence of thrombosis. There was a gradual decline in creatinine levels, and good graft function was achieved with a stable creatinine value of 1.2 mg/dL. DJ stents were removed at 2 weeks postoperatively. At 2-month follow-up, the patient has good graft function without any clinical or ultrasonographic evidence of ureteric complications. 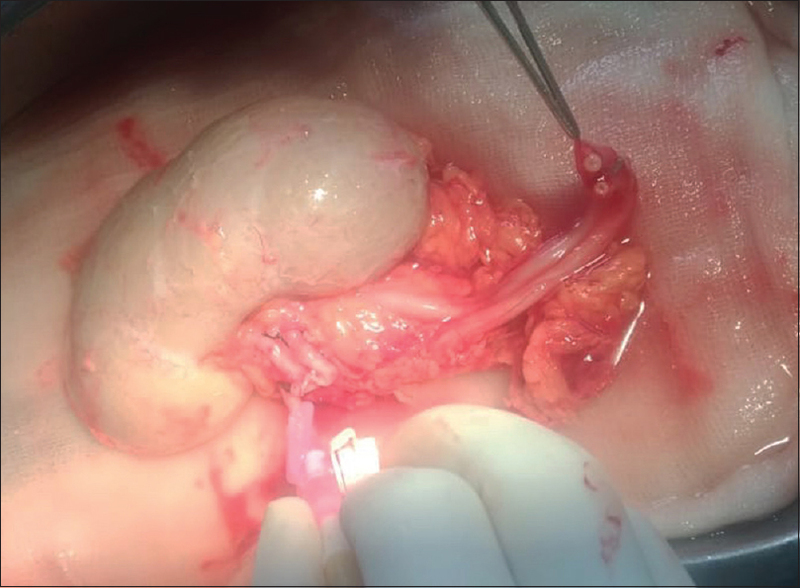 The presence of double ureter poses a challenge to the transplant surgeon as the risk of postoperative ureteric complications such as leak and stenosis may increase due to the increase in number of anastomoses. This potential increase in complication rate, however, has not been borne by the literature. Case series have reported a varying range of ureteral stenosis, from 0% to 10.5%.,,, The stenosis rate was found to be high (10.5%) by Haferkamp et al. while Ghazanfar et al. reported a low incidence of 1.3% in their case series of 76 patients. Urinary leak rates also vary in the literature, ranging from 0% to as high as 33.3%.,,, Sulikowski et al. reported a leak rate of 33.3% while Ghazanfar et al. have reported a rate of 4.0%. A possible explanation of higher leak rate in series by Sulikowski et al. could be omission of DJ stenting in 83.3% of their cases. However, Ghazanfar et al. reported no difference in urinary leak rates in DJ stent versus no DJ stent groups. The technique of ureteric implantation was also found to have no correlation with urinary leak rates as depicted by Ghazanfar et al. In their series, one patient in the common ostium group developed leak as compared to two patients in the separate implantation group. Ghazanfar et al. published a retrospective analysis of 76 double ureter transplants performed at two institutes of the United Kingdom and Pakistan from 1996 to 2011 and compared outcomes with renal transplants with single ureters. They found no significant increase in the risk of complications in transplants with double ureter as compared with single ureter. There were no significant differences in the patient and graft survival. In our case, the complete ureteric duplication was misinterpreted on CT as partial duplication as both the ureters were present in a common sheath. In fact, the duplication could be diagnosed only during perfusion of the kidney on the bench. It is also possible that the two ureters may have merged into a single ureter before entering the bladder. Complete ureteric duplication can be missed on preoperative imaging, especially if the ureters are in a common sheath. However, if picked preoperatively, it should not discourage the transplant surgeon while selecting donors because the presence of double ureter does not increase the chances of urological complications in a transplant recipient. Pollak R, Prusak BF, Mozes MF. Anatomic abnormalities of cadaver kidneys procured for purposes of transplantation. Am Surg 1986;52:233-5. Alberts VP, Minnee RC, van Donselaar-van der Pant KA, Bemelman FJ, Zondervan PJ, Laguna Pes MP, et al. Duplicated ureters and renal transplantation: A case-control study and review of the literature. Transplant Proc 2013;45:3239-44. Haferkamp A, Dörsam J, Möhring K, Wiesel M, Staehler G. Ureteral complications in renal transplantation with more than one donor ureter. Nephrol Dial Transplant 1999;14:1521-4. Ghazanfar A, Zaki MR, Pararajasingam R, Forgacs B, Tavakoli A. Outcome of kidney transplant with double ureter: A multicenter study. Exp Clin Transplant 2015;13:152-6. Sulikowski T, Zietek Z, Ostrowski M, Kamiński M, Sieńko J, Romanowski M, et al. Experiences in kidney transplantation with duplicated ureters. Transplant Proc 2005;37:2096-9.